I was surprised to discover this week that my eight year-old daughter is learning ‘Five-part Story Structure’ as part of her school curriculum. It’s not something I ever learned at school, and in fact was only exposed to for the first time quite recently, long after I’d started writing seriously myself. One thing that makes it particularly surprising is that my younger daughter, who is nearly six, has just started in the class where French children are taught to read, and some of the children in her class literally don’t know how a book ‘works’. (Not all of them. And you can make your own guess as to whether my own children love to read and engage with stories). Yet two years later they are already moving on to learning the constituent parts of a story. *I’ve been telling my daughters about ‘the bad part’ of stories for a while, because if they stop reading (or listening, or watching) a story when it all seems too scary to bear, they never get to see the hero pull through, and you are left without a satisfying and cheerful resolution. So in the exercise they are completing, they are comparing Charles Perrault’s original version of Little Red Riding Hood with the later Brothers Grimm version of the story and seeing how they differ at each of the steps. 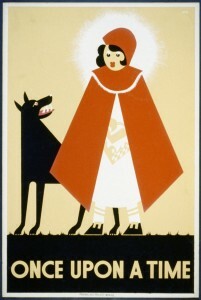 For example, unlike the milder Grimm telling (where Little Red Riding Hood and her Grandmother are rescued by the woodcutter, who slices open the Wolf’s stomach and sets them free, relatively undigested), in the dénoument of the original story, Little Red Riding Hood is lured into bed, and then promptly eaten by the wolf. The End. Secondly, the five part story structure seems to me a very oversimplified explanation of how stories are built. Unless the writer is being very formulaic, the journey between the opening and closing of a story can differ wildly from one story to another. Could this be a case of teaching a basic ‘rule’ first, and then going on to cover the exceptions? But are the exceptions not in the majority? Here is a link to an illuminating and funny Kurt Vonnegut talk where he plots out the structure of some well known stories. My final exception to the teaching of story structure to children is that if we are going to teach anything about storytelling we should start with the magic. We should explain to them why we tell stories, the profound effects that stories can have on human beings in terms of emotional responses, learning and social skills. We should explain that telling stories makes us human, and that we can all do it, and in fact we do all do it every day. That when my daughter walks in from school and says “Guess what happened to me today!” the magic is already starting. Thanks, Marisa. I love your reference to the man behind the curtain, a story in itself! Oh God, yes, agree. The question is, ‘when you were little, how did stories make you feel?’ — their memories of magic and book-hugs will fuel their literacy (& future literature). The magic is the most important part. The thrill of being absorbed in a story when you can really feel how the character must be feeling, or when you cannot leave the story for a moment, is so far removed from the process of deconstruction. It seems a shame for children to be taught to look at a story this way. Interesting post. Thank you. I feel particularly bad for those children whose only exposure to literature is at school. No bedtime stories to entertain, and remind them what is important. I was in my late twenties when I discovered the “how to” of stories, and it dramatically reduced my enjoyment of reading them for several years. I think I was in my thirties, and it had a similar effect. Lots to get our proverbial teeth into in this fascinating post. But so sad for those children being taught that stories are hard work. I found it enough of a challenge at fourteen learning to deconstruct literature for A-level, but at least it provided a route into stuff I wouldn’t have otherwise read. And I absolutely agree that story structure may not even be necessary for writers (for writers of academic papers, definitely, but it doesn’t necessarily translate to fiction), as with quite a lot of the how-to-do-it advice IMO. Thanks also for the reminder of the different versions of Little Red Riding Hood: as with the variations between readers and writers, not all of us would go for the happy ending. Thanks for posting this, definitely one I’ll come back to. Thanks Anne. I did love English Literature, and trying to understand the author’s intentions and the techniques s/he had used to try and achieve these. It gives a perspective not only to the individual text, but to the time and conditions in which it was written. Interesting point about story structure in academia. My most structured ‘stories’ have always been either academic essays or business documents. Thanks Deb, you’re certainly right that it is part of the school’s curriculum. The National Curriculum in fact. BUt I suppose what I’m asking is, should it be? On consideration I don’t think that it should. Rather, children should have much more time reading, and experimenting with the way they tell stories, before being told that there is a framework to follow. I think it diminishes from creativity and joy in storytelling. Guessing it would all depend on how it’s taught. As a group exercise, it could be a fun game (a bit like the party game in which one person writes the first paragraph, then folds the paper over to hide all but the last few words, for the second person to continue, etc, until the last person has written an “ending” and is allowed to open up the paper, at which point a crazy story literally unfolds). Still, though, with very young children I sometimes think it is more magical if the child believes they are ‘playing’, rather than formally ‘learning’… Horses for courses. Ha, posted at the same time as Claire, yes, agree C.
I’m a retired teacher.Thinking back over my teaching years, there was nothing so satisfying as reading to children, as well as having them discover the magic of writing their own stories. Not all children write spontaneously, but they can be led to it. One way ( my favourite) was to provide a pattern. I never did use story structure in the way mentioned here, but I imagine it could work just as well. It provides steps to help them put their stories together. Imagination is a wonderful thing but for most children structure helps them put their thoughts together to make a story. This is especially true when they want to put these thoughts in writing. In grade 3, most children who have been exposed to writing stories, using patterns should be able to handle the idea of structure without having it interfere with their imagination. It should improve their stories. Thanks, Pat. It’s great to hear from a teacher and what you say sounds very intuitive. Appreciate your comment. Very interesting topic. I only really learnt about the ‘mechanics’ of story telling when I went on one of those Robert McKee screenwriting courses and he demonstrated how nearly all films/stories conform to a set structure and how you have to know the rules before you can break them. Also, after three years of an English degree, it took me a little while to get back into just enjoying a book without deconstructing it to death! My daughter, who is nearly six, came home with a sheet of ideas as to how to write a story (revolving around the Quest idea) but it seemed a bit early to me. We’ve read different versions of various fairy tales, and she enjoys pointing out the differences (whether Little Red gets eaten and then pop out of the wolf’s stomach, or whether it’s the woodcutter of the father who saves her etc) but I’m not sure of the benefits of learning about the structure per se. I like the Consequences idea above. All really interesting! I hadn’t heard of the quest idea, I’m posting a link here, as it’s fascinating the different structures that are discussed. I went into a school this week, two lots of 9 year olds. They wanted to write their own stories. So we started making up characters. We sorted out what they most wanted in the world. (Most of the kids said ‘money’ but it soon turned out what they meant was ‘friends’). We sorted out a baddie who was going to stop them getting what they wanted. Then OOPS, OH NO, YOULL NEVER GUESS. Finally. BIG AH BUT, WOW BRILLIANT, AND ALL FINE. Thats technically it, I think! I just found your comment in spam, can you believe?! Dreadful behaviour on WordPress’s part! Also, are you going to blog about your school visit? This approach to teaching children reminds me of what I’ve heard so many writers who studied literature at uni. say, that it creates critics not writers. I so agree with you Claire on how it should start with imagination, children need to play with words and ideas first, then learn to shape them with structure as and when appropriate. It’s a bit like seeing what shapes, textures and colours crayons can make on that blank piece of paper before someone shows you how to hold the ‘pen’. That first immediate delight at engagement is crucial, it’s the joy of discovery and that’s innate, all that technical stuff can be learned later. I’m afraid it smacks of the ‘everything must be testable’ approach to me, that there is a right and wrong way to do it – well artists of all kinds have been challenging that one for centuries; thank goodness! Playing with words is so important, after all children are doing that through speech all the time almost from birth. Love Vanessa’s framework – spot on V!!! That’s a wonderful analogy. It’s hard to imagine not letting young children loose with fingerpaints, pencils, crayons and chalks. We love it when they give us stick men and smiley blobs, full of pride at what they created. Why can’t we also allow that with words? There’s far too much obsession on the mechanics and far too little on creativity which kids are full of. Absolutely agree with you on leaving childhood undisturbed, as it were, by analytical skills, especially when these pervade the magical realm. I feel quite strongly about this — Bruno Bettelheim did, who thought that we need to allow children to deal with the (eternal) truths encapsulated in fairy tales (death, good, evil etc) in symbolic ways; he wrote: «Play permits the child to resolve in symbolic form unsolved problems of the past and to cope directly or symbolically with present concerns. It is also his most significant tool for preparing himself for the future and its tasks.» — There’s a life time of tools & learning to wield them ahead of the growing child, but only a limited time of true wonder. Our daughter, at 12, has just emerged from that grove of Grimm’s tales & we can witness the losses as well as the gains only too well. It’s lovely to see you here, Marcus, you do leave the most insightful comments! Great quote from Bettelheim, which describes so neatly (one of) the roles of stories and storytelling in childhood. My daughter, who is now eight, picks and chooses stories that captivate her. Recently it has been tales of Norse legends, and ‘factual’ stories about great inventors or great scientists. Most recently she has gobbled up a story by Neil Gaiman (you can see her review here: http://www.amreads.com/?p=167 ) and a book of short fables about winter. What I find remarkable about all these stories that move her in some way is the way that afterwards she comes to me and wants to retell me the story. She always lays it out in the ‘formulaic’ way above, but not because she has been taught that. Rather because the original telling of the story has impressed her, I think, and she has naturally picked up the art of narrative. I don’t disagree that the narrative arc is important, particularly for writers, but I don’t believe it’s something young children need to be studying when they could be exploring other worlds. Totally agree with that last statement! Amelie’s review: COOL, @neilhimself – awesome praise! “Fortunately the Milk…”: never too late for us, looking forward to reading it, too! Awful! I still dislike intensely being told about ‘the seven plots’ and all the rest of it. I want to be swept away. When being ‘exhibit A’ in a creative writing seminar, my work was held up as an example of this or that. I have no clue what I am doing, I just do it. If only I had time to do more of it! Sticking a little “like” button onto Josa’s comment, I too want to be swept away. I love it when that happens, when you seem to have used a technique without ever knowing it existed. But you can give names to as many storytelling techniques as you like, and there’s still no recipe for ‘swept away’ is there?